My bike is all ready to go, with new cables and handlebar tape. Its always nice having fresh parts on your bike before you tackle a trip like this. We put so much faith in our bikes as riders, its nice to know that everything is in good working order for the journey ahead. 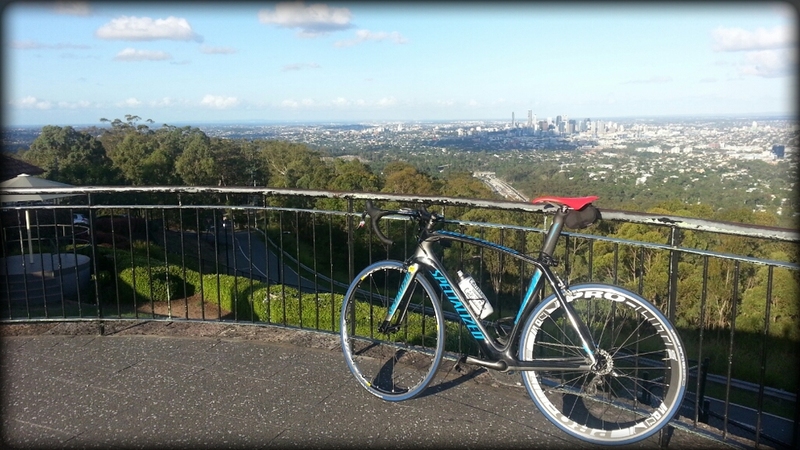 Here is the view from the top of Mt Gravatt. And here is the view from the top of Mt Coot-tha. On the weekend just gone, I went for a roll with my cycling club on the next installment of the "12 rides with KPCC." (Kangaroo Point Cycling Club) It was a beautiful ride through Springbrook, the Numinbah Valley, Chillingham, Tweed Valley & into Murwullimbah before making our way back to Twead Heads for some lunch. There is some fantastic scenery and views on this ride! The ascent up Springbrook is really nice. There aren’t too many hills/mountains that I class as “nice to ride” but this was one of them. Its a nice easy 4.5% rise over the distance, so its easy to find a rhythm and power your way to the top. The weather was a bit damp in places, so the temperature was nice and cool for the ascent. Once we had all regrouped at the top of the climb, we started our descent to try and beat the rain that we could see coming our direction. Its not fun descending in the rain on wet roads. It can be hard to see, roads become slippery and you generally lose your braking ability due to water on your wheels and brake pads. There can be some scary moments if you dont stay alert in those conditions. Next stop was the “Banana Cabana” in Chilliingham. At this rest stop, it is compulsory to partake in a chocolate covered, frozen banana. Yum! We ate them all! We had a chance to refill water bottles, refuel ourselves with something to eat and try and dry out as much as we could before riding on. The rain was hit and miss from this point. It was just going to be one of those days on the bike with wet/soggy shoes and socks… Yuck! But the views at the top of the climbs and the comradery between team mates took our minds off the conditions. We ended up back at the Twead Heads pub for a well deserved feed. Chicken Parmigiana and a pint of Bulmers cider was on the menu for me, and it was delicious! There is something about having a meal after a big ride that just makes it so much more enjoyable... All up it was a 130km round trip with about 1800m of climbing for the day. Not a bad hit-out for a wet/cold morning. Definitely a ride I look forward to doing again in the dry weather. We had a fund raising event last night for Peter Oost. (a fellow tour rider) I met and rode with Pete on the QLD Country Tour in 2013. Dinner was held at a local Italian restaurant called Tiramisu in Paddington. The owner and his staff did a great job of cooking up some delicious food for us, and Pete did a fantastic job of hosting the night and telling everyone a bit about what TdC do and why he has come back to ride with them again. It was great to meet some new people and talk about our up-coming bike ride. Its always good to see the positive reactions of people who dont realise how much work TdC riders and support crew do during a typical day on tour. Its not just about riding our bikes from 'A' to 'B', there are a lot of jobs and things to do throughout the day also. That wraps another week. Less than 2 weeks to go before Tour kicks off for 2014! Stay tuned for more updates and thanks for all your support!